Interested in learning how to play the guitar? Take guitar lessons with our amazing teachers and you’ll be playing in no time! For more than 40 years we’ve been helping aspiring guitarists of all ages, playing levels, and preferred styles become better musicians through our unique one-on-one personalized approach to guitar lessons. You will work directly with our expert instructors to receive a customized learning experience by incorporating the music that you like most into their teaching curriculums. In short, you’ll learn the necessary fundamentals of the instrument while learning how to play the music you enjoy. Once you have a strong foundational knowledge and your skills progress on the guitar, you and your instructor will move on to more intermediate level material such as ear training, complex chord shapes, modal scales, improvisation, and more. Guitar lessons for the intermediate to advanced players will be structured around your specific goals and take into account the kinds of songs and styles of playing that you wish to develop. If you’re are unsure of which areas to work in, our instructors are more than capable of helping you explore every possible avenue on the guitar (and there are a lot!). 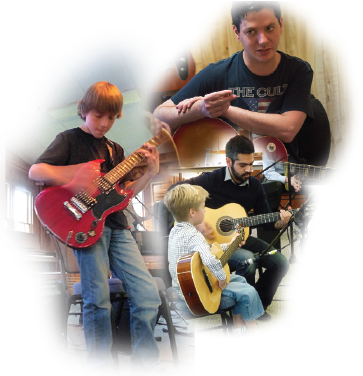 Guitar students typically start at age 8 and up. It’s never too late to learn! If you’re well into adulthood now is the perfect time to pick up that guitar and take some lessons like you’ve always dreamed of doing. Our most senior student started guitar lessons at 94 years old.